A new country music concert event arrived on the UK scene at the weekend and it was free! 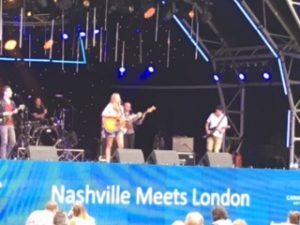 Organised by Peter Conway Management, Canary Wharf Arts and Events, and Nashville-based agency, The AristoMedia Group, Nashville meets London was a two day festival at Canada Park in London’s Canary Wharf. 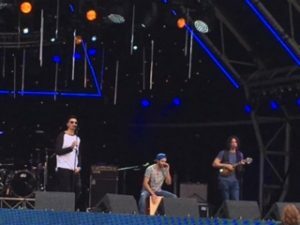 The event brought together a mix of UK and US acts. 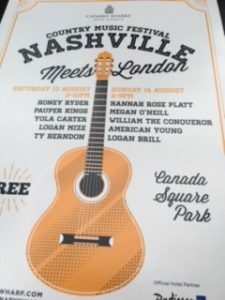 There were ten acts playing over two days including, Logan Brill, Ty Herndon, and Logan Mize from the US, and Yola Carter, Megan O’Neill, Pauper Kings, Hannah Rose Platt, Honey Ryder from the UK. Free events can be a bit “tacky” but this one worked really well. Good weather helped and the unusual setting of seeing bands playing in a small park surrounded by the skyscrapers of Canary Wharf actually added to the intimate feel of the event. We were only able to make the Saturday show but there was a good turnout of country fans and possibly a few newcomers. . The wonderfully named Honey Ryder (the band is named after a Bond Girl) kicked the show off. York’s Pauper Kings, who we saw in Nashville at CMAFest, put in a very assured and professional performance while Yola Carter brough a touch of “country soul” to the stage. The US acts seemed to thoroughly enjoy the fact that the Brit audience listened to the songs, even the ones they didn’t know, which I suspect was quite a few of the tunes. I though Logan Mize was very good and will be looking out for his recordings. So overall was Nashville meets London a hit? Yes, from a fans point of view and I think from that of the performers it was. Perhaps like C2C this event will become a fixture on the UK country music scene. Although the tight nature of the venue doesn’t allow much room to grow in size I suspect the size of the acts, particularly those from the US could grow in stature. And finally, an honourable mention to the host Beylen Leonard, an American broadcaster now based in the UK who can be heard presenting country music shows on BBC Radio 2 among other places. He put together, curated is, I believe, the modern term, a playlist between the acts.